On Sunday I went to my first concert of the year. I went to see Against the Current and they pulled such a great show. I went alone and if you’ve read my previous post you’ll know how I felt about that. Here I want to focus mainly on the concert and the VIP experience, which was a Christmas gift that I received. I was at the concert’s venue two hours before they’d open the doors for the VIPs. The waiting was a bit boring and it was freezing cold so yeah, not fun at all. But once inside everything felt better. We were quite a big group of people and we were told to sit on the floor and the tour manager explained how the whole thing would go – what we could and couldn’t do, the order in which things would happen, etc. So after that, the band arrived and they talked a bit to us and then played two acoustic songs: Blood like Gasoline and Runaway. It felt so intimate so I didn’t want to film it or take pictures of it. I just wanted to enjoy it. Everyone was so quiet and just listening to them play was like being in trance. When it was my time to meet the band I hugged and said hi to each of them. Then, before we got our picture taken I thanked them for coming and told them that their music and that they three made me so happy and that I really needed that happiness. They were so nice to me and said it was alright, that they were glad I went to see them. They also asked me if I had seen them last year so I said yes. They smiled at me the whole time and said nice to meet you once the picture was taken. Honestly, such nice people, all three of them. People often just care about Chrissy and it pisses me off because Dan and Will are equally just as great and it’s so sad to see that some people only look at her (or only care about her) when they’re meeting the whole band. Like hello, Dan and Will exist and they’re wonderful too, appreciate them and respect them all. So when I talked to them I did look at them three and you know just talked with them all, not just 1/3. Okay, rant over, sorry. That's me with them (Will, Chrissy and Dan) and please let's forget how bad and awkward I look and focus on them. Also lol at how smol Chrissy and I are. After I had my picture taken, I picked up my signed poster at the merch stand at the entrance. Fun fact for you: when I was going back to the concert room I bumped into the whole band who I suppose was going back to their backstage room or something. It was so weird to me like I opened the door and they were there. They said hi again to me and I was buzzing. Anyway, after that, we all just had to wait a while for the concert to start. A Spanish band, Silhouet, played first, they were good. I liked their music and the covers they played, even if I only knew one (Drown by BMTH). Then the band that supports ATC during the whole tour, Hunger, came on stage. They were so good too, I really enjoyed their set. It was their first time in the city and their first time touring so it was pretty amazing. It's always good to discover new music!! I even got their CD after the concert because it was just 5€ and they were there selling it and signing it and giving away free stuff so why wouldn’t I? Against the Current were absolutely amazing and full of energy on stage. The first four songs were very intense and made you want to jump and sing along like crazy. If you want to listen to them, they are: Blood Like Gasoline, Running With The Wild Things, Talk and Young and Relentless. After those four songs, they slowed it down a little bit with Chasing Ghosts and Roses. Both are beautiful songs with excellent lyrics. Even though they’re slower songs than the previous four, they still have the same vibe in some parts of the song with strong guitar and drums sounds, especially during the chorus and the last parts. Then they played Runaway which is such a catchy song, especially the chorus; it’s a fun song to dance around to. Another good song to jump around and let go is One More Weekend, which they have just started playing on this tour. Before moving on to the next song, Chrissy gave a speech in order to introduce it. She said they wrote that song to explain how they loved music, that for them it feels like something that’s so much a part of you that it’s in your bones. They wanted to write about that feeling, about having something, whatever it is, that it’s not only that you love it so much but that it is you. She said she wants to feel that everyone has something like that, whatever it is - their career, something they do on the side, or what they dream of doing one day. With this song they wanted to say that they know these things come at a very hard cost and that there are usually obstacles along the way. She put touring as an example, because it isn’t easy for them, but that what makes it all worth it is moments like that, playing in front of people from Barcelona when they are from New York. For them, it’s the best feeling in the world and she said it's hard to explain it because it’s so unique. She wanted us to know that whatever it is that’s in our bones is equally as a part of us as music is for them. So, she thanked the crowd for being there and told us they loved us. And if you haven’t guessed, the song is called In Our Bones and it’s one of my favourites by them. Again, beautiful lyrics and the speech made them even more special. Their song Brighter came right after and it’s also a very meaningful song. I believe it’s about going after your dreams and what you want. Giving all you’ve got, living life the way you want, that there’s “something beautiful hiding in the shadows”, and that it’s never too late to start doing whatever it is you want to do. So it’s a very empowering song in a way. As if I wasn’t emotional enough after those two songs, they played my absolute favourite song by them: Paralyzed. I really connect with the lyrics. It’s a very powerful song with strong melodies. Will at the drums was brilliant, not just saying this because I love the song but because it was, he was great in every song though. I couldn’t see his face from where I was standing but perfect anyway. After this song, Chrissy gave another speech, not as long as the previous one, though. She thanked the support bands and said that it was great that the Spanish one’s lead singer was also a girl; because you know GIRL POWER and she also pointed out that her shirt said ‘girls bite back’ because well, it’s true. Then she said they were gonna play the last few songs. Wasteland was the first of the last three songs. It was okay but I don’t really like the lyrics, they aren’t bad but personally, I don’t connect with them so yeah. My favourite thing about it was that Chrissy did her usual ‘bent-back’ thing. It’s so impressive. The second to last song was Dreaming Alone. An oldie but a goodie. It’s a rather slow one; there’s a good vibe to it too. Also, during the last part, Chrissy held hands with a few of us whilst she sang. And they ended the set with Gravity which is probably their most known song. It’s a very energetic song and a good one to end the show with; it makes you jump and dance around just like the first few songs. Overall, I really enjoyed myself. I tried to push back the anxiety and I kind of forgot about it for the most part of the gig so that's perfect. For the most part, I really didn't care that I was by myself and just enjoyed the whole thing. If you’re still reading this, thank you. I appreciate it. I know I ramble a lot but I just wanted to explain the whole concert. 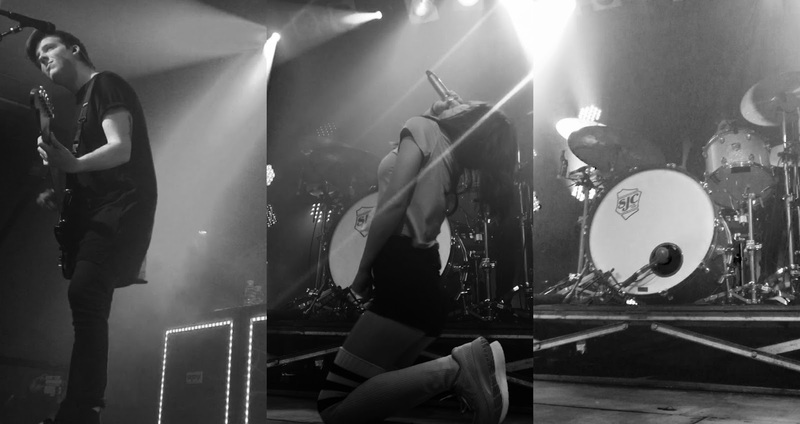 If you haven’t listened to Against the Current I hope you do after reading this post, it’s okay if you don’t, though. Have you ever listened to Against the Current? Are you going to any concerts this year?